The proposed site was the former Ministry of Defence, BASF, Colham Mill Road site located on the outskirts of West Drayton, London, which was previously used for the manufacture of paints. The facility was effectively split into two sections by the Frays River with the east side of the river employed as the main production area. Information obtained from both the London Fire Brigade and various other sources confirmed the storage and use of large volumes of a variety of solvents. These included acetone, toluene, benzene, ethyl benzene, xylenes, methyl isobutyl ketone (MIBK), white spirits etc. In addition there was also limited storage and use of chlorinated solvents at the site. Site investigation data revealed the presence of a range of organic contamination with some heavy metal contamination also identified. 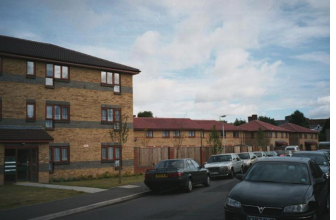 The West Drayton site was developed for residential end-use by Alfred Mc Alpine Partnership Housing. The remediation strategy for the Colham Mill Road site was designed to address the source contamination on-site and indirectly the pathway contamination issues, with the intention of protecting Human Health and the identified groundwater receptors. Construction of an in-situ physical barrier of low permeability. The physical (passive) barrier is designed to prevent migration of contaminated ground water from the treatment zone and also prevent ingress of ground water into the treatment area. The physical barrier forms part of the peripheral wall and is designed to work in conjunction with the active treatment wall. Construction of an in situ active treatment barrier of relatively high permeability. The active barrier is designed to allow passage of ground water through the wall whilst at the same time removing the contaminants by a Combination of chemical sorption and reaction processes. By combining the above, the Envirotreat Process has been designed to treat the site as a whole. It is imperative that the identified contamination areas are mass treated prior to constructing the active and passive walls to ensure that ground water does not become re-contaminated or further contaminated by passing through untreated contamination zones. The works were conducted over a 4 month period. Specialist technology, materials and supervision were supplied by Envirotreat, whilst May Gurney supplied all the required plant, and labour for application of the Envirotreat Process.